All Tropic homes currently listed for sale in Tropic as of 04/21/2019 are shown below. You can change the search criteria at any time by pressing the 'Change Search' button below. If you have any questions or you would like more information about any Tropic homes for sale or other Tropic real estate, please contact us and one of our knowledgeable Tropic REALTORS® would be pleased to assist you. "Victorian Country Charmer ! 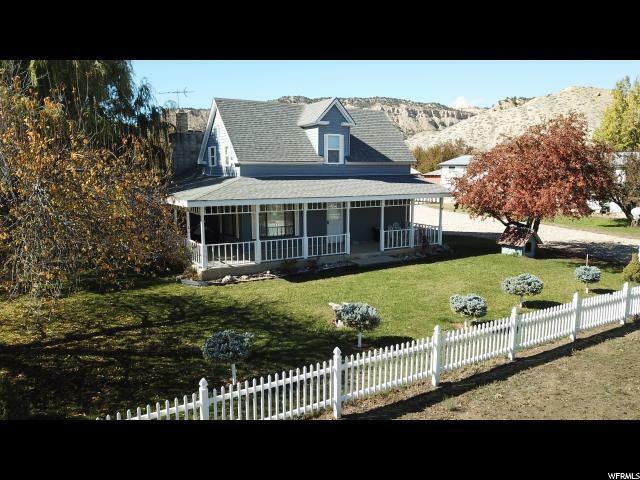 This is the home you've dreamed of with a wrap around porch, white picket fence, orchard, huge garage/ shop and 20 shares of irrigation water, all situated on a 1.30 acre corner lot. Plus the great views of Powell Point with Bryce Canyon Nat'l Park nearby. What more could you ask for? . Must see shop with canning room, sink & range. Don't let the age fool you. This home was completely modernized in 1985 with new plumbing, electrical, drywall and cabinets. LP Fireplace and electric baseboard heaters. Alaskan Sauna. Incredible orchard with apple, plum, pear, peach, apricot, and cherry trees. 20 shares of Spring Creek irrigation included! Root cellar, shed, chicken coop, mature trees and the coolest tree house built around an Aspen tree. Garage / workshop fits 2+ cars deep with shelves and a loft / storage. Insulated canning room with sink and range + separate craft room. Gotta see this one to believe it. Priced to sell quickly. Buyer to verify Square Footage"